Big news from Julep today: the reveal of their May Maven box! ...May, you ask? What happened to February, March, and April? 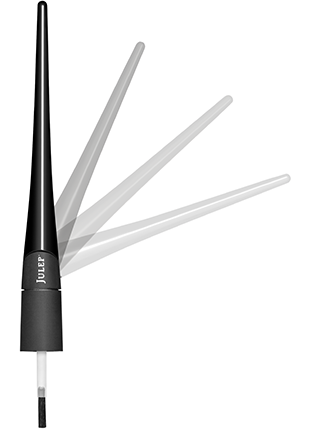 You're looking at the plié wand, a nail brush entirely designed and developed by Julep in hopes of making polish application easier -- even with your non-dominant hand! According to Julep, the plié wand provides unprecedented control over your at-home manicure, and even bends to be cradled in your non-dominant hand to steady and direct it. If the plié wand actually delivers, it's a totally genius idea. I'm strictly a DIY-manicure kind of girl, because why pay someone 20 bucks to swipe me with my own polish when I can do it myself and enjoy the job? But I'm also hopelessly right-handed and I'm fidgety: I'm a messy nail polisher and would make a terrible, terrible surgeon. So this smart little contraption sounds pretty amazing. Plus the design is kind of sexay! Looks like a super-elegant stiletto heel, no? So anyway, why the preemptive reveal if the plié wand won't be shipping out until May? Well, apparently Julep needs some help covering the costs of production, so they've decided to crowdfund the project, à la Kickstarter, to raise the necessary dollahs and allow non-Maven donors to secure their own plié wand sets. Mavens can also pre-pay for their May boxes to ensure they'll be recipients of the first run of boxes in case, based on demand, more than one run is necessary. If you want to learn more about this upcoming product and check out all the donation and reward levels, click on this link to the Julep plié wand crowdfunding page. Big news on the PopSugar Must Have front, too, in the form of a --wait for it-- 50% off coupon!!! I know, I was totally shocked myself: I don't think PopSugar has ever released a coupon this serious! If I weren't already subscribed, I'd use this guy in a heartbeat! The magical, mystical coupon code in question is ASK50: if you're a new subscriber, plug it in at checkout watch your total shrink from $42.75 for the first box in your monthly subscription to a mere $21.37! Be warned though, the code does not work for three-, six-, or twelve-month subscriptions. Again, that's ASK50. Plug it in! Get half off a three-, six-, or twelve-month subscription to Bulu Box (health, nutrition, and weight loss sub) with code HALFBACK. Get The Beautiful You collection from Total Beauty for $27 (reportedly an $80 value) with code ANNIVERSARY. Korean beauty sub service Memebox is taking preorders for its fifth box. For a special discount of up to $10, check out this post on the Hello Pretty Bird blog. Japanese candy sub Skoshbox is offering a Premium Valentine's Day box, limited to a run of only 100, for $25. Regular monthly subs are $12. So, to bring things full-circle, what are your thoughts on the Julep plié wand? Are you going to crowdfund and preorder your May box?